Despite our initial plans we didn’t get a chance to visit North Korea. The country can be visited only on an organised tour that departs from China (Beijing) and, as you would expect, there is not much wandering around during the couple of days here. The North Korean guide will show you exactly and only what North Korea wants you to see. We were, however, happy to at least take a peek and learn a bit more about the Korean relations at the DMZ – Korean Demilitarised Zone. 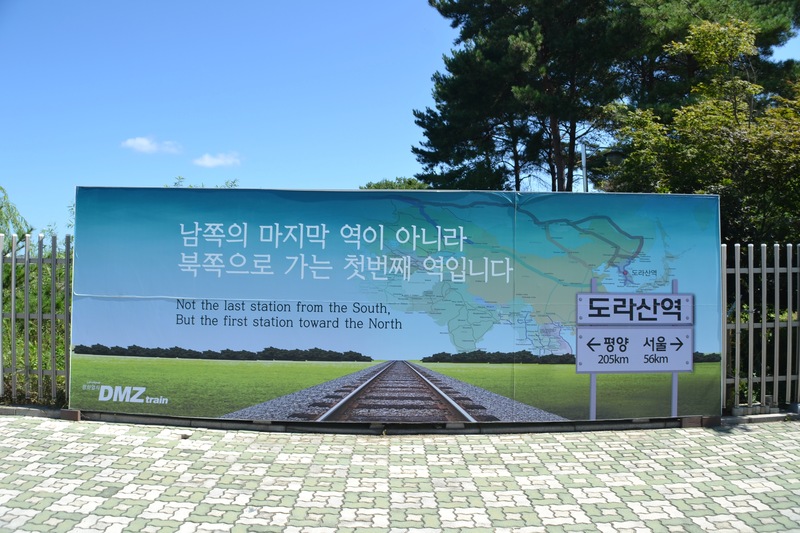 Tours are organised from Seoul, but you can also visit the DMZ along other parts of the border. We didn’t want to miss out on the visit to the Joint Security Area (JSA) and so our choice was clear. We booked our tour well ahead (as the demand is high) and chose KoriDoor tour company that is affiliated with the United Service Organisation, a nonprofit organization that provides services United States troops and their families. 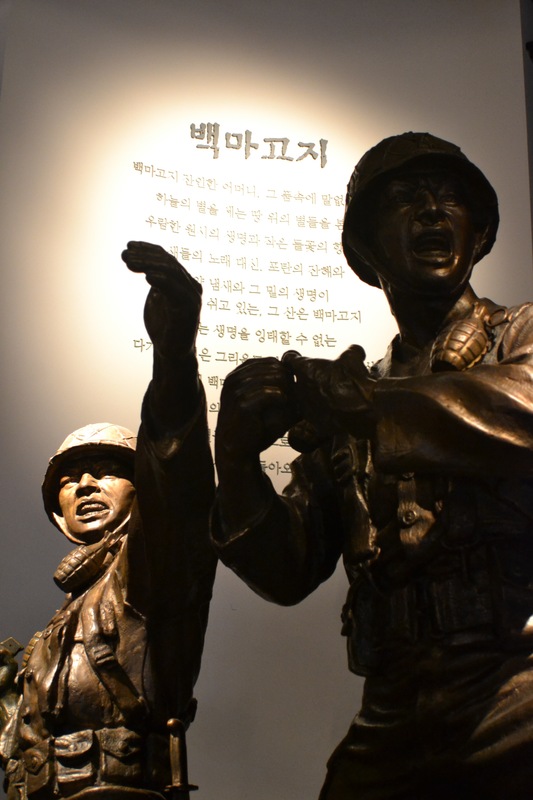 Moving back a few days, to learn more about the Korean war and the status of the mutual relations, we spent a few hours in a very well curated War Memorial Museum. The whole peninsula was under Japanese rule from 1910 until WWII . When war against Japan was declared in 1945, the peninsula was split along the 38th parallel between Russia and United States and after the war separate governments, that both claimed their rule over the peninsula, were set up. The conflict escalated when the North supported by Russia and China invaded the South on June 25, 1950. They managed to ‘conquer’ a great part of the South with this surprising attack. By the time the North covered almost the whole of the South, UN troops (88% of soldiers being US) had organised themselves for their defence and managed to push the northern troops back and even further, all the way north towards the Korea-China border. That’s when the Chinese entered the war. Their strength was, as the museum shows, not in their weaponry, but in the huge number of troops. Many soldiers didn’t even carry any weapons. Instead they were equipped with musical instruments to be able to make a lot of noise and scare away the enemy! The North backed up with hundreds of thousands of Chinese soldiers managed to push the UN troops back to the 38th parallel and since then, fighting continued, but there wasn’t much of territory exchange. Tired of the war, armistice negotiations started in July 1953. The peace talks still take place today, in the JSA, but a peace treaty has never been signed. The main problematic topic of the negotiations was exchange of the prisoners of the war. Not all Northerners wanted to return back and this wasn’t acceptable for the North. As part of the armistice agreement a buffer zone to prevent a conflict has been set up alongside the new border – Military Demarcation Line – that divides the peninsula roughly in half. Each side agreed to move back their troops 2km from the line. The 4km stripe in between – the DMZ – is according to our US navy guide filled with land mines, but flourishing with wildlife. Our tour bus pulled in at Camp Bonifas entrance. From here a young US navy soldier had to accompany us wherever we went. Our first stop was the Joint Security Area Visitor Centre where we took seats in a briefing room and were handed a disclaimer to sign. Other than that we understood the rules and wouldn’t make any faces at the North Korean soldiers, we also released the organisers from being responsible for our accidental death. The US navy soldier then took us – with his awesome southern accent – through the war history as well as the history of the DMZ itself. Afterwards we were taken to the to the Military Demarcation Line passing through the South Korean Freedom House. The North has a same kind of a building, which they upgraded to stand just slightly higher than the one of their counterpart. Between the two Freedom houses, right on the demarcation line, there are a few small buildings. These have been used for negotiations between the two parties. 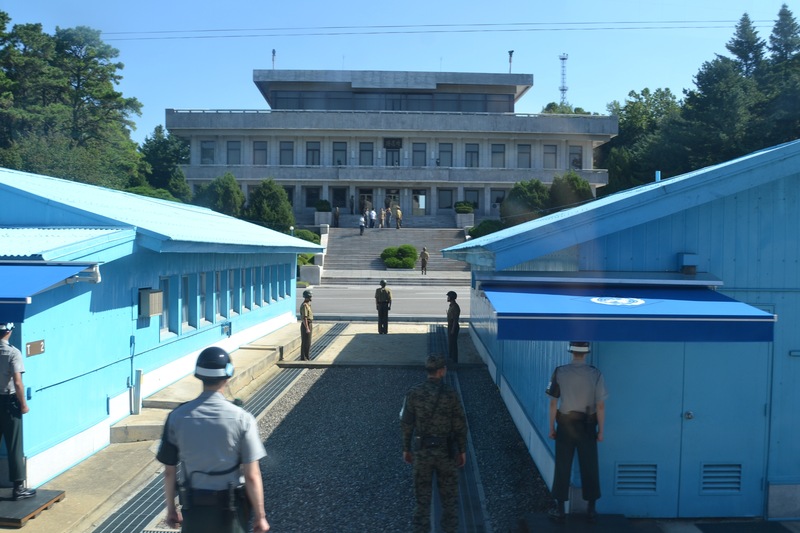 As the soldier told us, the one on the right is nicknamed ‘a monkey house’ because of the loud discussions and expressive gestures that North Koreans use here to show their plans are serious. We were taken into the middle one. While outside we could see both Northern as well as Southern soldiers guarding the area, inside the house there are only two Southern soldiers. If visitors come from the north, they will leave and from the northern door, northern soldiers come in. We were told about an incident when the Northerners attempted to grab and kidnap a Southern soldier through their door. Ever since, a second soldier has to hold the one who is unlocking the door from inside. We shouldn’t touch the furniture but were told that a visitor who did the same tour from the North before shared that they were let to sit on the tables. The most impressive in the room are the two guards themselves. You could easily confuse them for wax figurines. The stand motionless with their fists ready to fight and their sunglasses covering their eyes completely. All the guards are black belt in taekwondo and the ready fists are supposed to scare the Northern guards. Although it was a bit awkward, all tourists including Lucia took pictures posing next to the ‘wax’ guard at the northern door. Technically we were in the North Korea at that point! We could also take pictures of the outside, but only directed at the north. We are then rushed outside and create a line on top of the stairs at the Freedom Line. While our guide / soldier shared other details, the action was starting on the opposite site! A few guards marched out of the building creating a formation. Then the door opened again and our excited group saw a group of northern ‘tourists’ doing the same thing – taking a tour! We were told later that, obviously, tourism is not a common hobby in North Korea, and the visitors were most probably just a high ranked official’s family or friends. The next stop on this little weird tour is a viewpoint where we can peek into the North Korea properly for the first time. There are two ‘peace villages’ in the DMZ, Tae Sung Dong on the southern part and Kijong-Dong on the northern. 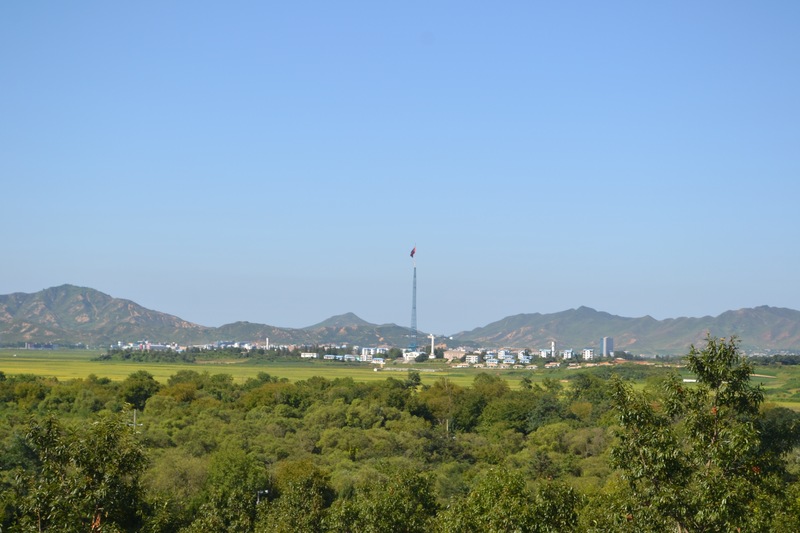 While the residents of Tae Sung Dong live their normal life growing rice and the usual, Kijong-Dong is dubbed ‘Propaganda village’ as it is mostly uninhabited. The lights switch on and off here at set times every day and the buildings appear to have no glass in the windows and no rooms either. When the village in south built a 98 m tall flagpole with a 130 kg flag, the North answered with building an even taller – 160 m – flagpole holding a 270 kg flag. Until 2004 the village loudspeakers broadcasted loud propaganda speech encouraging southerners to cross the border towards a ‘better life’. On the southern side of the DMZ we could see telephones all along the road. These are supposed to serve for the northern defectors, so they can be picked up by the UN. On the way back to the visitor centre we pass ‘Bridge of no return’ which was used for the exchange of the prisoners of war. We let you figure why the name… Just a couple of meters from here the bus stops at the ‘Axe Murder Incident’ memorial stone. In 1979 the UN soldiers tried to trim a tree that stood in the view between checkpoints. 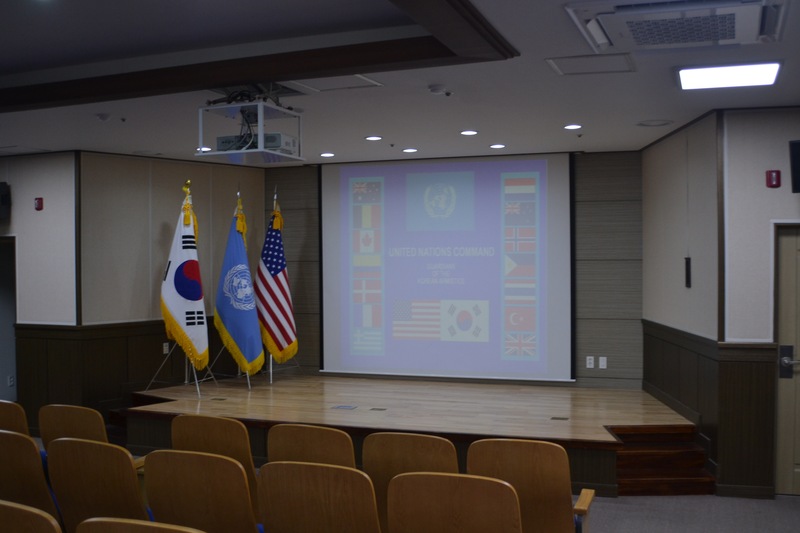 After a verbal exchange between them and the North Korean soldiers brutally attacked the UN soldiers using their own axes that they dropped while attempting to run away. Our next stop is Dorasan railway station, ‘the first station toward the North’. If ever the two Koreas connect by rail, you could easily reach Seoul by train from anywhere in Europe. Before we reach the 3rd Infiltration tunnel, we stop for some more view over the North. Mark spotted a farmer cycling and we could also see all the towers built along the boarder to prevent any signal to pass to the North. The 3rd infiltration tunnel is one of the four tunnels discovered in the 70s. By the direction of blasting lines it was clear that the tunnels were built southwards by North Korea. They even painted them black to disguise them as coal mines in case they get uncovered. We couldn’t bring our cameras, but we walked inside all the way to a concrete blockade that was built upon discovery to prevent infiltration. On the way back to Seoul we watched the Korean movie ‘J.S.A. : Joint Security Area’ that tells a story about a friendship of South and North Korean guards. If you would like to see it, let us know. This day was definitely a great experience for us and it made us think a lot about the situation here. 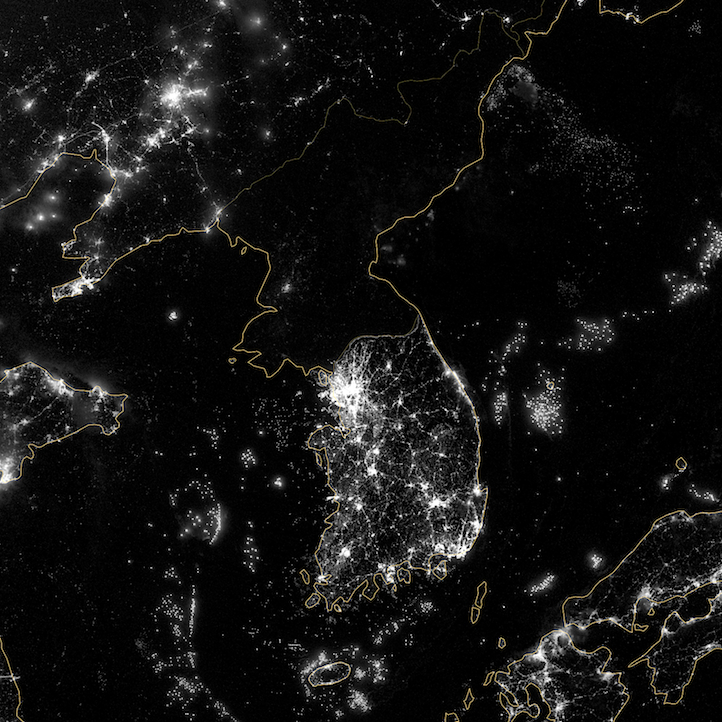 Just looking at a satellite photo of the peninsula one can see a huge difference between the two countries. The famine, abuse of human rights, propaganda and brainwashing in the North Korea must stop one day. South Korea is hoping for the change and unification; they even have establish their Ministry of Unification for this purpose. Let’s hope for the best! Aj keď sme to pôvodne mali v pláne, nakoniec sa nám nepodarilo zaradiť výlet do Severnej Kóreje do nášho itinerára. Do tejto krajiny sa dá dostať cez organizované zájazdy z Číny (Peking) ale, ako by sa dalo očakávať, návštevníci sa počas týchto dní nemôžu len tak po krajine potuľovať. Severokórejský sprievodca ich vezme a ukáže im len to, čo Severná Kórea chce, aby svet videl. Našťastie sme mohli ale využiť iný spôsob, ako do tejto krajiny aspoň nakuknúť a dozvedieť sa niečo viac o vzťahoch medzi dvoma Kórejami v demilitarizovanej zóne – DMZ. Výlety sem sa dajú zorganizovať v Soule, ale pásmo sa dá navštíviť aj v iných častiach krajiny. My sme chceli vidieť hlavne JSA – Joint Security Area (Spoločná bezpečnostná zóna) a tak to, že pôjdeme zo Soulu bolo jasné rozhodnutie. Zarezervovali sme si miesta dostatočne dopredu, kedže dopyt je dosť veľký a miesta obmedzené. Išli sme cez agentúru KoriDoor, ktorá pôsobí vrámci USO, organizácie, ktorá zabezpečuje servis americkým vojakom a ich rodinám. Vráťme sa na chvíľu ale pár dní späť, keď sme vrámci vzdelávania navštívili War Memorial Museum – Vojenský pamätník a múzeum – v Soule. Kórejský poloostrov bol od roku 1910 až do druhej svetovej vojny pod nadvládou Japonska. Keď Rusko v roku 1945 vyhlásilo Japonsku vojnu, poloostrov si spojenecké mocnosti rozdelili pozdĺž 38. rovnobežky, kde sever náležal Rusku a juh Spojeným Štátom. Obidve novovzniknuté oblasti nastolili separátne vlády, ktoré obe proklamovali vládu nad celým poloostrovom. Konflikt vyústil 25. júna 1950, keď sever so súhlasom a podporou Ruska a Číny prekvapil útokom juh. Veľmi rýchlo sa im podarilo postúpiť až na juhovýchod Južnej Kóreje a ovládnuť takmer celý poloostrov. Spojenecké vojská OSN (tvorené z 88 percent americkými vojakmi) sa našťastie stihli zorganizovať k obrane a po niekoľkých mesiacoch zatlačili severanov až na sever ich vlastného územia k hraniciam s Čínou. Vtedy sa do vojny pridali aj čínske vojská. Ich sila nebola skrytá v technológiách, ale v obrovskom množstve ľudí. Mnohí, ako múzeum ukazuje, dokonca nemali ani zbrane, namiesto nich ale niesli rôzne hudobné nástroje, aby hlukom zastrašili nepriateľa! Sever posilnený stovkami tisíc Číňanov postupoval naspäť na juh k 38. rovnobežke, kde boje porkačovali bez zásadnej výmeny teritória až do dohody o zložení zbraní. Vyjednávania o zložení zbraní započali v júli 1953. Mierové rokovania ale trvajú až dodnes, keďže mierová dohoda doposiaľ neexistuje. Jednou z najproblematickejších tém v roku 1953 bola výmena vojnových zajatcov. Nie všetci severania sa chceli vrátiť domov a to pre sever nebolo akceptovateľné. To, že sami vrátili len zlomok zajatcov juhu, bola asi iná vec. Zároveň s dohodou o zložení zbraní sa strany dohodli na vytvorení nárazníkového pásma, ktoré by malo zabrániť ďalším konfliktom, ktoré bolo postavené okolo novej hranice – Demarkačnej línie. Táto rozdeľuje poloostrov zhruba na dve polovice. Obe strany posunuli svoje vojská 2 km od tejto línie. 4-kilometrové pásmo, ktoré tak vzniklo – DMZ – je podľa sprievodcu, amerického vojaka, takmer celé podmínované, no za desiatky rokov sa stalo rajom pre kórejskú divokú prírodu. Autobus s našim zájazdom zastavil pred vstupom do vojenskej základne Camp Bonifas. Od tohto momentu turistov musí sprevádzať armádny príslušník, v našom prípade mladý americký vojín. Našou prvou zastávkou bolo návštevnícké centrum JSA, kde nás usadili v prednáškovej sále a rozdali nám k podpisu prehlásenie. Okrem základných pravidiel a prísľubu, že nebudeme na severokórejských vojakov robiť žiadne ksichty, sme podpisom oslobodili organizátorov zodpovednosti za našu prípadnú náhodnú smrť. Vojak nás potom – s úžasným juhoamerickým prízvukom – previedol krátkou históriou vojny a samotnej zóny. Po prednáške sme sa presunuli cez juhokórejský Freedom House už priamo k Demarkačnej línii. Aj sever má má svoj Freedom House, položený presne oproti, ktorý už prešiel prestavbou aby stál vyššie než ten juhokórejský. Medzi oboma “mierovými domami” stojí pár malých budov priamo na línii. Tu prebiehajú rôzne rokovania medzi stranami. Jeden z domčekov južania údajne nazývajú “opičím domom” vďaka zvukom a výrazným gestám, ktoré odtiaľ vychádzajú počas naoko dôležitých mítingov severanov. My sme sa mohli ísť pozrieť do toho uprostred. Zatiaľčo vonku stoja stráže severu i juhu, vnútri sú teraz len južné hliadky, dvaja vojaci. Ak návšteva príde zo severu, južania odídu a cez severné dvere sem napochodujú severní strážci. Odkedy sa raz pokúsili severokórejci vytiahnuť jedného z južanov cez severné dvere, odomykajú ich južania vždy vo dvojici, aby jeden druhého mohli podržať. Nesmeli sme sa dotýkať nábytku, ale jeden turista, ktorý absolvoval túto túru aj zo severu bonzol, že severní sprievodcovia dovolia posedávať aj na stoloch. Najzaujímavejšími v miestnosti sú práve dvaja juhokórejskí strážnici. Ak by ste nevedeli, že sú skutoční, mysleli by ste si, že sú to voskové figuríny. Stoja úplne nehybne so zaťatými päsťami a super tmavými slnečnými okuliarmi. Všetci strážnici musia mať čierny pás v teakwonde a pripravené päste údajne vzbudzujú strach u severanov. Aj keď to bolo trochu trápne, turisti vrátane Lucie, si neodpustili zapózovať pri “voskovom” strážnikovi pri severných dverách. Prakticky v tejto chvíli sme stáli už v Severnej Kóreji! Fotky von oknom boli dovolené, ale len ak objektív mieri na sever. Dlho sme sa nezdržali, museli sme z domčeku odísť a sformovať sa do radu na schodoch pred Freedom Housom. Zatiaľčo sprievodca rozprával, oproti nám sa začalo niečo diať. Pár strážnikov vypochodovalo zo severského Freedom Housu a vytvorilo formáciu pri hranici. Dvere sa potom otvorili znova a my sme mali možnosť vidieť severokórejských “turistov” pri tej istej aktivite, ako my – na prehliadke! Neskôr nám bolo povedané, že keďže turizmus nie je veľkým hobby na severe, návštevníci boli pravdepodobne rodinní príslušníci či známi nejakých vysokých armádnych príslušníkov. Ďalšou zastávkou tejto podivnej prehliadky bol kopček, z ktorého sme prvýkrát mali poriadny výhľad na Severnú Kóreu. V pásme DMZ sú dve “mierové dediny”, Tae Sung Dong v južnej časti a Kijong-Dong na severe. Zatiaľčo obyvatelia Tae Sung Dongu si žijú normálny život, obrábajú ryžové polia a tak ďalej, Kijong-Dong má prezývku “Propaganda village”, keďže je v podstate neobývaná. Svetlá sa v celej dedine zapínajú a vypínajú v ten istý čas každý deň a budovy nemajú sklo v oknách a dokonca ani rozdelené poschodia či izby. Keď juhokórejská dedina dostala 98 metrov vysoký vlajkový stožiar a 130 kilovú vlajku naň, sever ihneď odpovedal postavením ešte vyššieho – 160 metrového – stožiaru s 270 kilovou vlajkou. Až do roku 2004 severokórejská dedina vysielala hlasné rozhlasové vysielanie propagandy, ktorou lákala južanov prejsť hranicou za “lepším životom”. Na juhu pozdĺž ciest v DMZ sme si všimli telefóny rozmiestnené pravidelne tak, aby prípadný utečenec zo severu mohol ihneď kontaktovať OSN. Cestou naspäť k návštevníckemu centru sme sa zastavili u “Bridge of no return” – “Mostu bez cesty späť”, po ktorom prebiehala výmena zajatcov po vojne. Názov jasne hovorí o podmienkach výmeny. Len pár metrov odtiaľto náš autobus zastavil pri pamätníku “Axe Murder Incident” (Incident sekerovej vraždy). V roku 1979 sa tu vojaci OSN pokúsili orezať strom, ktorý im stál vo výhľade medzi stanovišťami. Po slovnej výmene so severanmi boli vojaci brutálne napadnutí sekerami, ktoré zanechali na mieste pri pokuse o útek. Ďalšia zastávka je vlaková stanica Dorasan, “prvá stanica smerom k Severu”, ako stojí na bilboarde na peróne. Ak sa raz Južná a Severná Kórea spoja železnicou, z Európy sa bude dať dostať do Soulu vlakom. Pred návštevou 3. infiltračného tunelu sme sa ešte zastavili na špehovanie na sever. Mark cez ďalekohľad spozoroval severokórejského farmára na bicykli a tiež sme si mohli prezrieť veže postavené po celej dĺžke DMZ na severe, ktoré slúžia na rušenie akéhokoľvek signálu. 3. infiltračný tunel je jeden zo štyroch objavených v 70tych rokoch. Podľa smeru stôp po výbušnine je jasné, že bol postavený smerom na juh severokórejcami. Steny tunelu sú nafarbené načierno, aby ho v prípade odhalenia mohli vydávať za baňu na čierne uhlie. Museli sme nechať foťáky pri vchode, ale zostúpili sme až na úplný spodok a prešli tunelom až k betónovým blokádám, ktoré boli postavené po objavení. Cestou naspäť do Soulu nám pustili kórejský film “J.S.A. : Joint Security Area”, ktorý hovorí o príbehu priateľstva medzi juho- a severokórejskými strážnikmi. Ak máte záujem si ho pozrieť, dajte vedieť, máme. Tento deň bol určite veľmi zaujímavý a zanechal v nás veľa dojmov a myšlienok. Pozrite sa na satelitný snímok kórejského poloostrova v noci a bude vám na prvý pohľad jasný obrovský rozdiel. Hladomor, porušovanie ľudských práv, propaganda a vymývanie hláv v Severnej Kóreji raz musí predsa prestať. Južná Kórea otvorene bojuje za zmenu a zjednotenie; majú dokonca aj špeciálne Misnisterstvo Zjednotenia pre tento účel. Držíme celej Kóreji palce! ← Seoul has got a soul!